You did of course commit Diego Ulissi’s name to memory after he won stage four. Just as well really being as he won stage 11 as well. The Italian has now won 16 races in his home country since 2012 and none anywhere else. 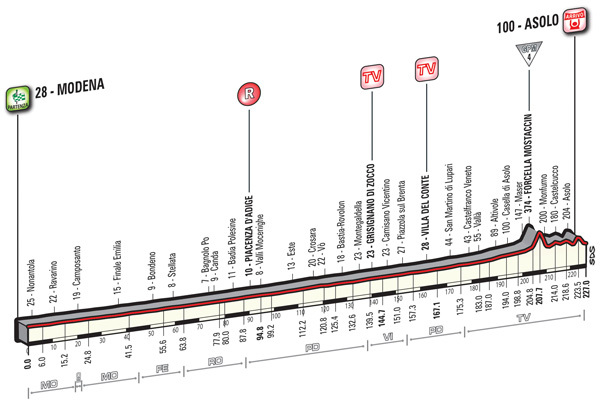 Maybe the distance is finally starting to tell in this Giro. Look at the profile above and a sprint finish seemed likely, if not probable. But the rumpling over on the right hand side was enough that the stage ended up a battle between the general classification contenders. For the second stage in a row, Andrey Amador produced the attack that stuck. Race leader Bob Jungels went with him and then Ulissi followed. The Italian was the fastest finisher and moves into the top ten overall, but Jungels and Amador gained another 15 valuable seconds on the men immediately behind them. They gained more than that on Domenico Pozzovivo who got stuck behind a crash and lost over a minute. Tom Dumoulin, meanwhile, has abandoned the race. He’s had saddle sores for a while now and while they’re just about tolerable when you’re wearing the pink jersey of race leader, they’re a pain in the arse, or thighs, or grundle, when you’re not. Come on, this one has to be a sprint stage. Just look at it. 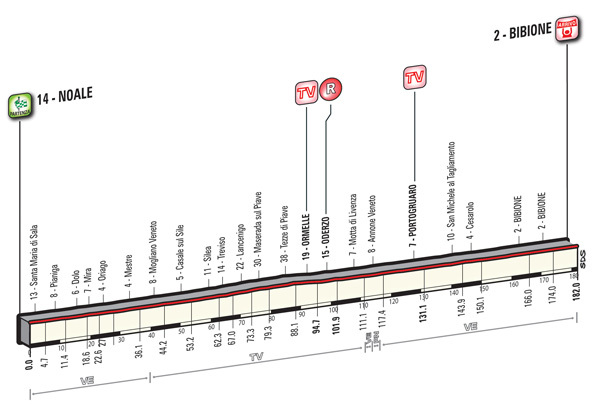 It’s so boring that the official stage preview doesn’t just mention roundabouts, it also mentions kerbs. Local delicacies of the region include ‘radicchio and all related recipes’ and ‘seafood in general’. I am beginning to warm to whoever it is that issues the dishes of the stage. They’re so general as to not even quite qualify as dishes: chianti, raddichio, lard; more sort of ingredients. Either whoever writes these up is just doing this as a total afterthought in a busy day, or is having to list vague dishes that could be served in many ways to placate hordes of persnicketty local chefs, or is deliberately doing a quarter-assed job because they hate the whole idea and don’t mind showing their contempt for the whole deal. I can’t decide which possibility is funnier. They were very specific last year. This year, they just seem to be throwing anything and everything on there. Even playing the numbers game, they’ll do well to top creamed lard though.